Two weeks ago I stopped at Fishs Eddy to buy a little present for a friends birthday because I knew I would find something for her there. P and I had gotten her a Ticketmaster gift card that hadn't arrived yet and I was looking for something we could give her instead and make my own gift card to go with it. Luckily I found this little tray that looks like an old movie or concert ticket, which was perfect. I just mounted it on a piece of black foam core and called it a day. Of course I could not leave the store without buying something for myself. I bought a tea towel from the Lotta Jansdotter collection. I really like her designs and did not know she had a collaboration with Fishs Eddy. All items from this collection are blue and I have rounded up some of my favorites below. I can really identify with her approach to design, which is Can’t find what you want? Make it! Don’t know how? Learn it!, although most of the time I don't follow through with my ideas and make them a reality. It's something I should really change! Is her motto something you can relate to? 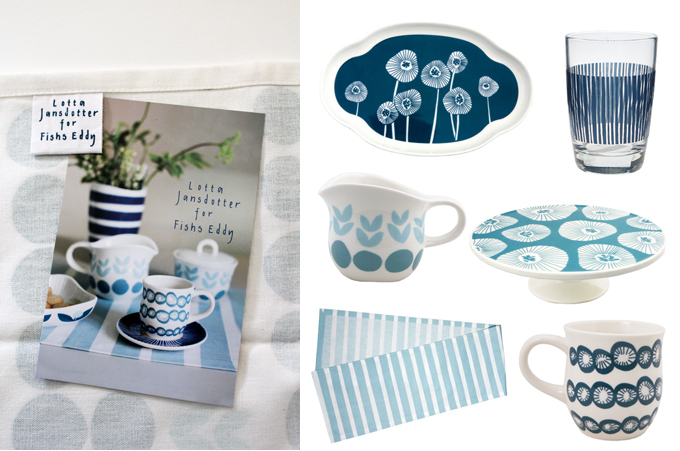 Do you own anything that features one of Lotta Jansdotter's prints? Hi there! I am back from the sick and out of my bed again. Honestly I don't know what is wrong with me this winter because I seem to get one cold after the other and this time it really knocked me out. I am still not feeling a 100% yet. Maybe it was the flu? Who knows but it is good to be back! Nothing much happened last week besides sleeping, watching tv and some more sleeping. Last weekend I managed to squeeze in going to two Estate Sales, one was in my town and on Sunday I met up with Santa and we checked out one a couple of towns away. The one Santa and I went to was already picked pretty clean but I still managed to buy two pieces, a metal filing box for records and an incomplete Scrabble game, that I wanted just for the letters. Can you believe I never played Scrabble in my life? Of course I already had some fun with the letters last night. I probably was one of the few people that did not watch the Oscars. Did you watch? I will have to check out all the dresses from the red carpet today, that is always my favorite part about award shows. 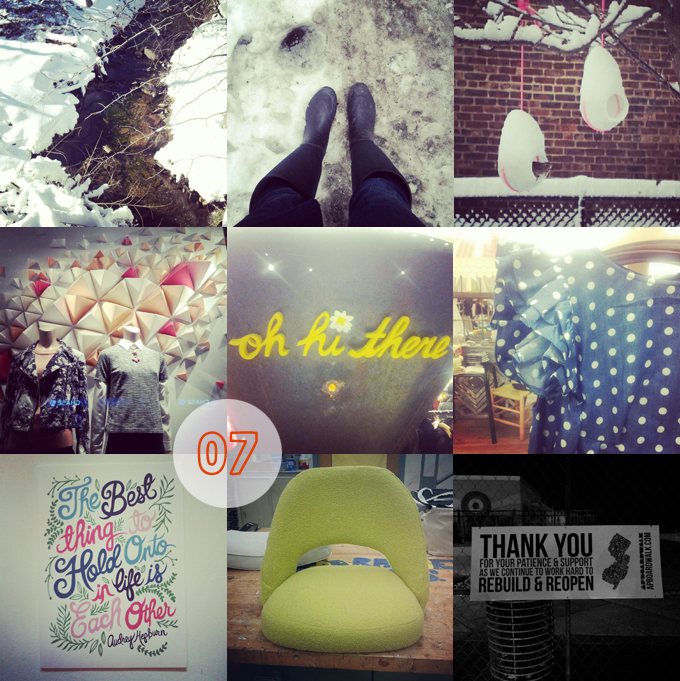 I am so ready for week nine to be better than week eight and also to resume my regular blogging schedule! PS. 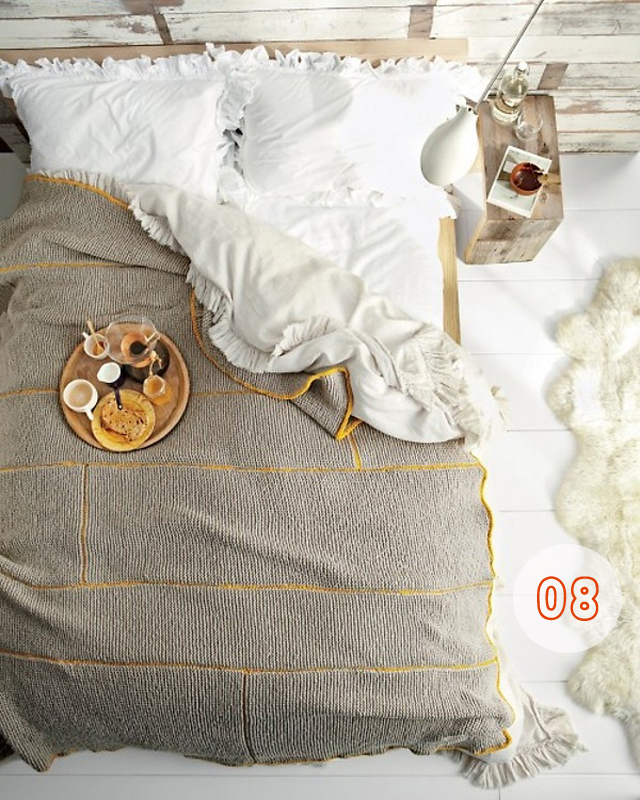 Unfortunately this is not my bed below but you can find the how to for knitting this blanket over here. Last Wednesday a friend of mine took me to an event at Anthropologie for the new Karen Walker collection they are selling. Of course I fell in love with all the pieces that had stripes or polka dots or a combination of both. As you already know I had my upholstery class on Thursday and from your comments on Friday's post I think I will start working on the green chair next. I hope I can handle the challenge because it will involve much more sewing than the last one. I actually started looking into taking an upholstery class after finding the green Saarinen chair on craigslist because I didn't want to spent a fortune having it reupholstered by someone else. So this chair has been sitting in our basement for quite a while and it deserves to be pretty again. 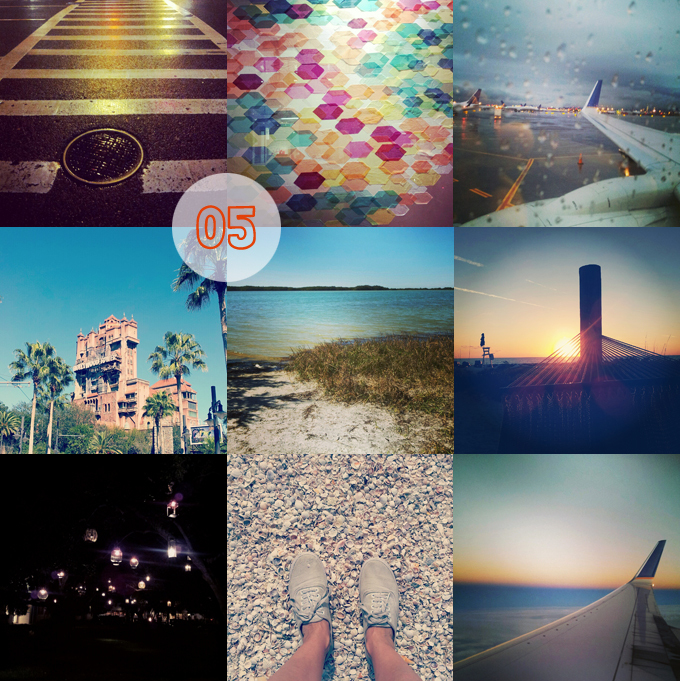 I hope the rest of the week my posting will be on schedule...Enjoy week eight! Yesterday my upholstery course started again and I almost finished the chartreuse Saarinen chair so I have to bring a new project to class with me next Thursday. 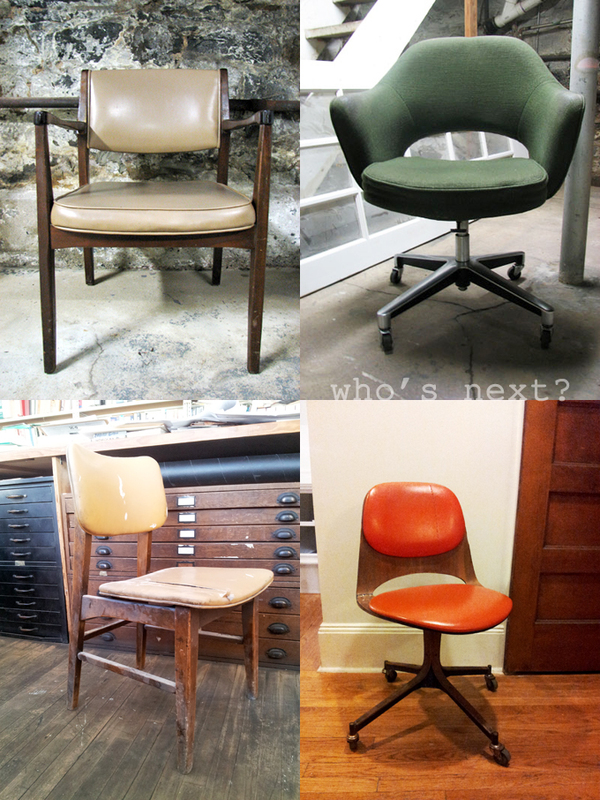 Here is a round of the chairs that are sitting in our basement and are waiting for a makeover. I think I can handle the orange chair by myself, as I would only have to wrap the fabric around the seat and back cushion, staple it in place and call it a day. Of the first chair I have three and thought I could upholster two in black leather and one with a colorful print. Marimekko , maybe? For the second chair I am not sure what fabric to pick. I still have enough of the chartreuse bouclé fabric to use on this chair. Chair number three also could possibly be a project I could tackle on my own. Argh, I am so indecisive but I think I have narrowed the choices down to the first two chairs. What do you think? Who's next in line for getting a makeover? Are you having Monday (President's Day) off like me? What are your plans for the (long) weekend? I am planning to work on some house projects and also use a day to hang out on the couch to enjoy that we got free HBO for a couple of months. I hope you will enjoy your weekend too! I am not really into Valentine's day but even I can't resist the hearts popping up on clothing and jewelry. Back in March of last year I even made my own felt heart patches to repair an old cardigan. Since then I have used that technique more than once now to repair beloved sweaters that had holes in them. Initially I had planned to show you my ten favorite pieces with hearts on them but when I labelled my collage an eleventh item had founds its way on it. Oh, well there were just too many great choices. Are you in on the heart craze? What are your plans for Valentine's day? I will have a date with my upholstery class, it starts again tomorrow. Can't wait to finish my yellow chair. Happy Valentine's day my lovelies! Hope you all had a great weekend as well! Are you guys ready for week seven? Last week started with a rainy Monday and in the evening I met with two lovely ladies I met in my Blogging Your Way Boot Camp Class last October. Jodi is writing Craft Your Craft and Tina writes the blog Life in Sketch. I hope we'll do this again soon! I wanted a barn door right after I saw it here. P and I agreed that it would make sense to have a barn door in lieu of a regular door in our upstairs bathroom, as the door was swinging into the already small room. The existing bathroom door was cheap looking, dinged up and unfinished and not worth saving, pretty much like almost all our upstairs doors. Of course I started to search craigslist and Ebay right away for the perfect door for my project and found it around Christmas of 2010 (yes, 2010!) in Connecticut. The door was located near friends and we planned to visit our friends after picking up the door. Our friends cancelled last minute because the whole family came down with a stomach bug but we still headed to CT to pick up the door. When we hit the road it was snowing lightly, there was some talk about a blizzard the day before which we both shrugged off as being totally exaggerated. The roads were pretty clear until we left the freeway, this was when we realized it had snowed more than we thought. We loaded up the door, grabbed a quick bite to eat and started our journey back to New Jersey. The drive back took forever because it was snowing pretty hard and driving got worse by the minute and I was a nervous wreck when we finally made it home in one piece. The next morning I opened the door and we had three feet of snow. After all we had to go through to get the door home we stored it in various rooms around the house until we started to renovate our guest bath and powder room and had our contractor put it up. I was afraid if I would give it a try it might fall off the wall as I am very good at missing studs by a millimeter. 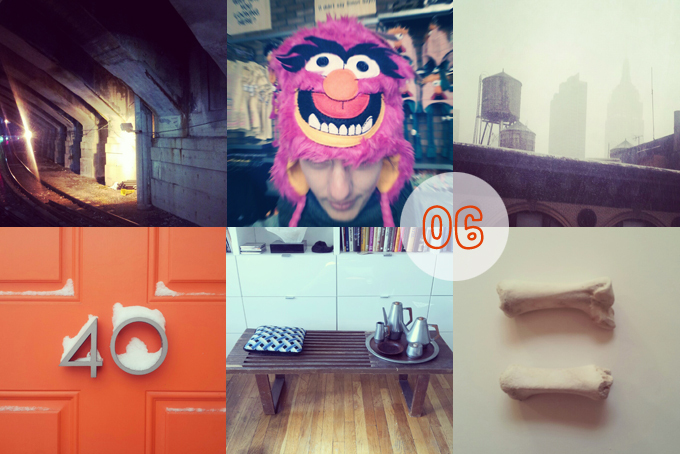 It all started with a peach colored hallway and cheap and beaten up doors. First thing we did was to throw out the door to the room on the right, my office, because it was falling off its hinges. A week later we remembered that my parents had to stay in that room because they helped us paint the house and move in. Classy people like we are I just nailed an old bed sheet to the door frame and called it a day, at least it gave them some privacy. The left door leads into P's office, it needs to be replaced as well. Although it doesn't look so bad in the photo the wood veneer is coming off in several places, where it has been nailed back into place. My office is still without a door as is the hallway closet and our "walk-through closet" that leads to our bedroom. 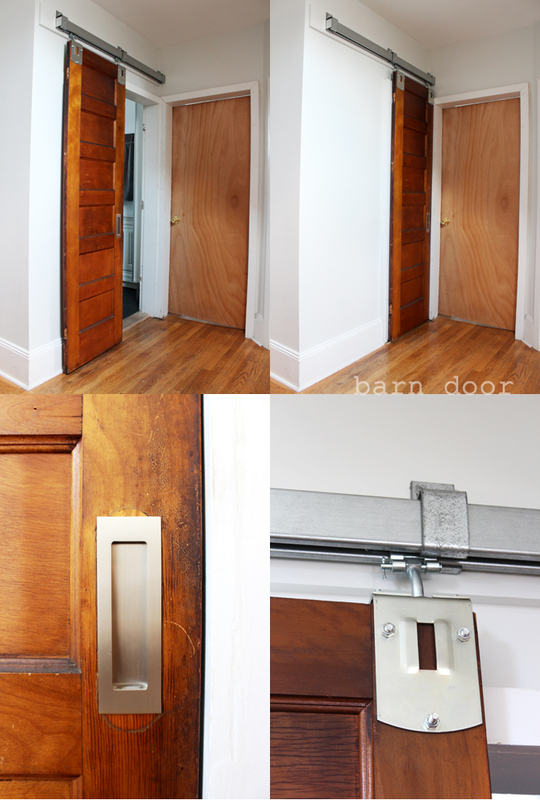 We love our new barn door and I cannot believe it took me so long to finish this project. 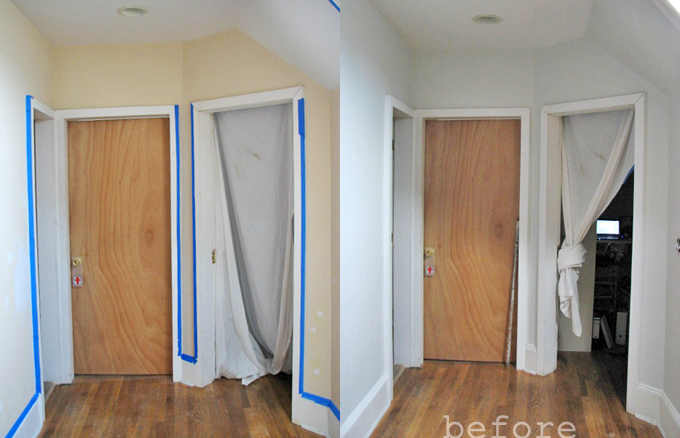 At first we thought about painting the door but we think its imperfections make it look just the way we like it. It's funny to talk about all the snow we had back when we picked up the door because I snuck away to sunny Florida yesterday and when this post goes online I am either on my way to or already at the Disney Hollywood Theme Park. Miss Piggy & Kermit here I come!